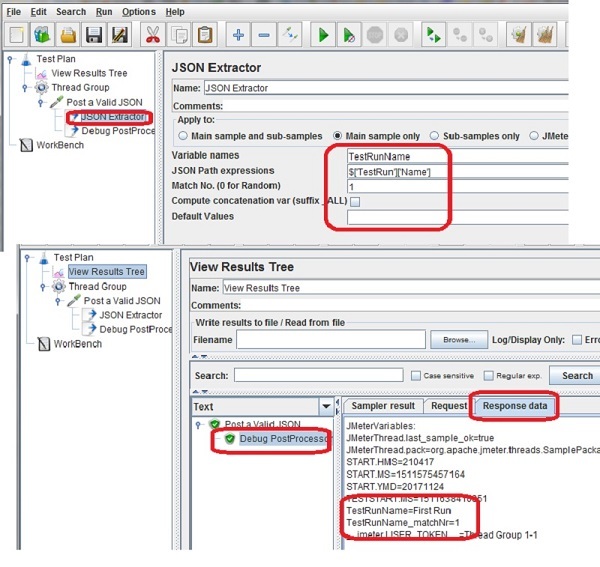 How to use JSON Extractor to capture data from JSON message in JMeter? The JSON Extractor allows you to capture data with a JSON expression match. If a match is found, the matched data is capture in a given variable. You can follow this tutorial to see how JSON Extractor works. 1. Copy and create a Test Plan called Azure-Echo-API-JSON-3.jmx. 3. Add a Debug PostProcessor after the JSON Extractor to "Post a Valid JSON" sampler. 4. Check the output of Debug PostProcessor under "Post a Valid JSON". You see the JSON data captured in "TestRunName" as "First Run".